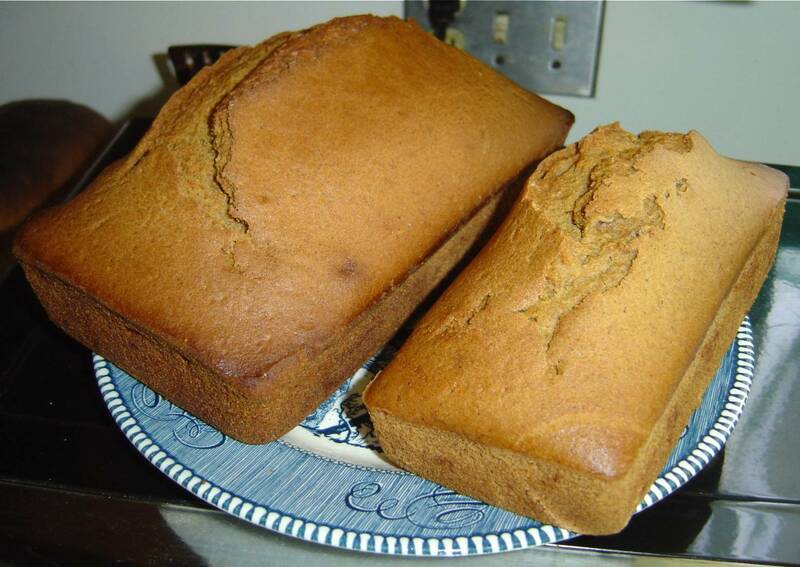 This yummy pumpkin bread stays moist! I wasn’t planning on making pumpkin bread. However, I was cleaning out my freezer and found one last container of fresh cooked pumpkin from my small pumpkin crop of last season. I was debating whether to make a pumpkin-ravioli or this delicious pumpkin bread, but I forgot about the ricotta cheese so I wanted to share this one with you. What is fantastic around this pumpkin bread is that you can use fresh or canned pumpkin and it’s so easy to throw together. Trying to make this a healthier version, I reduced the sugar and salt and use only canola oil instead of a margarine without harming the fantastic flavor of this treat, which also stays moist very well I might add. You can make one normal loaf pan and one mini loaf, perfect for eating now and freezing one for later. This pumpkin bread recipe also makes wonderful muffins. When my normal oven was in working condition, I used to make a tray of those six giant muffins from this recipe. Oh, those were the days of baking glory! My former mailman used to say my house had the best aromas on the block. I still do all my baking in my flea market toaster-oven, which I invite all sponsors needing their own toaster-ovens, induction burners, appliances, cookware, or any food for me to create recipes around to email me, and I’ll put it through its paces or make something special to showcase those products! You get two loaves–one to enjoy now and another to freeze, if you like. Add your oil, eggs, pumpkin, water, and sugar into a mixing bowl and beat with your electric mixer to combine. Sift your dry ingredients and then add and beat further until thoroughly mixed. You can stir in raisins and chopped walnuts last, if you prefer. I usually go plain, but I know how others crave those both in their sweet breads. This makes a 9.25 x 5.25 x 2.75″ (typical loaf pan size) and one tiny loaf or six king size muffins or 12 regular muffins. Pour into your greased pans and bake at 375 degrees for about 45-50 minutes, depending on your oven. Insert a toothpick or knife to see if it comes out clean first.